research that I have done over the past two days. Hypothesis: Istanbul is more enjoyable in nice weather. normally-gray city, we were dealing with rain and freezing cold temperatures in the city that was once Constantinople. this all-too-brief encounter by sitting outside with some wine. various parts of the Middle East. When I stepped outside, I was met with the combination of sun and a slight breeze. 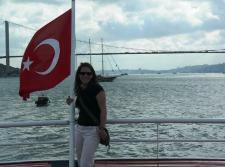 On the ferry along the Bosphorus Sea.